Madhu Nataraj-Heri is the director and choreographer, STEM Dance Theatre (Bangalore). Termed "strikingly original", STEM (Space.Time.Energy.Movement.) 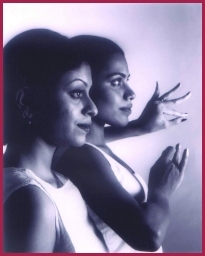 Dance Theatre has emerged as one of India's leading contemporary dance companies. Excerpts from their most recent work, “MOH - In the realm of love”, explore the different textures, shades and layers of love. Leading Indian artists in design, music and dance have come together to create this vibrant contemporary Indian dance production.